According to Chinese media, the country's first commercial flight to Antarctica brought 22 lucky tourists to the exotic destination this weekend. The trip is hailed as a milestone - but is it really? And what does it tell us about China's geopolitical ambitions in the region? Is it really a first? Described in Chinese papers as the beginning of a new era in the country's tourism to Antarctica, the trip took the select few from Hong Kong all the way to the actual South Pole. That meant a 15-hour flight to South Africa, refuelling in Cape Town and then another 5.5 hours to Antarctica. 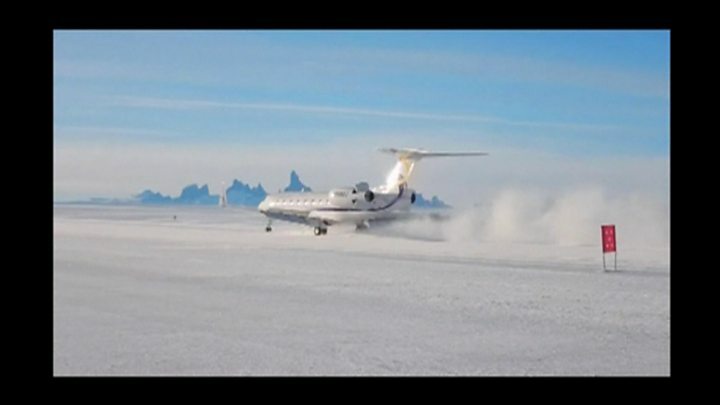 From there, it's another five to six hours to the pole, where the flight landed on a 2.5-km (1.5-mile) runway carved into the ice. The Chinese tour operator describes the trip as a milestone, saying it means Chinese tourists no longer have to book via foreign agencies. But how much of a first was it really? The leg from Cape Town onwards was in fact organised by White Desert, a tour operator who offers such trips to the pole on a regular basis. That means it was rather a co-operation between a Chinese tour organiser and one of the established players based in South Africa. Does a trip that long strike you as something of an ordeal? Just consider that the usual tourist route is significantly longer. Heading to the seventh continent by plane is the exception rather than the rule. Almost all tourists come by boat - typically from Argentina's southernmost port of Ushuaia. Another option is from New Zealand - a route often picked by people interested in a more historical itinerary tracing the footsteps of famous past explorers like Sir Ernest Shackleton for instance. "Trips differ in length - they can be six days to three weeks or even longer," Leanne Flanagan Smith of tour operator BackTrack Adventures told the BBC. Why do people want to go there? There are many reasons, she says. "For some people it's simply a bucket list thing - it's their seventh continent and they want to tick it off. Others come for the wildlife but usually end up being more impressed and overwhelmed by the ice and the spectacular landscapes," she say. Travel season is during the Antarctic summer from November until the end of March. What's the price tag? The cheapest options will cost you around $5,000 (£3,750) - that's by boat from Ushuaia so you'll still have a substantial additional air fare just to get to Argentina. Can Antarctica cope with mass tourism? On the whole, visitor numbers are going up. After having reached an all-time high of 46,265 visitors in the 2007-2008 season, visitor numbers dropped in the following years due to the global economic crisis. But numbers have been steadily on the rise again over the past years. Last season 44,367 tourists visited the continent and numbers are expected to keep rising. The International Association of Antarctic Tour Operators (IAATO) was created to promote a safe and environmentally responsible tourism industry and works closely with the Antarctic Treaty Parties, which is a partnership of more than 50 countries jointly governing the continent. There's still room for more tourists, Amanda Lynnes of IAATO told the BBC. "But continuous monitoring is absolutely key," she added. The tour operators are following very strict guidelines laid by the organisation, according to Ms Lynnes. One such rule for instances is that there can never be more than 100 people on shore at any one landing point at any one time. Once on land there are also strict rules - even detailing how close you are allowed to walk up to a penguin. "This is very symbolic," explains Dr Nengye Liu of the University of Adelaide. "It ties in with the bigger picture of China getting more and more actively involved in Antarctic affairs." Chinese tourists already make up the second largest group of visitors, second only to those from the US. The number of Chinese tourists to Antarctica has grown significantly in recent years, from fewer than 100 in 2008 to 3,944 in 2016. And if the steep rise in interest from past years is anything to go by, Chinese visitors will soon top the table. "In Chinese media, this is presented as the first time that tourists can travel through a Chinese operator," Mr Liu says. "Of course it's extremely expensive but it does showcase China's growing interest in the region." Since 2013, China has identified the polar regions as one of the country's new strategic frontiers. And that means there's a strong political will in being part of how the governing of the poles will be shaped in the future. At the recent Communist Party Congress, Beijing's new five-year plan clearly stated that the government wanted to invest huge amounts of money in projects towards the exploration of the poles. "Eventually, China's ambition is that they will be able to put forward their own proposal to influence how the two polar regions will be governed," Mr Liu says. Despite the current example of a top-of-the-menu extravaganza all the way to the pole, most Chinese tourists of course take the normal route by cruise ship from South America. In fact, only 1% of tourists fly to the interior of the continent. "A flight that takes you to Antarctica and then continuing on to the actual Pole with another plane - that's really just for the bucket list people: tourists that really want to tick off the South Pole and can afford it," Ms Flanagan Smith says. Where is the remotest part of the world you've been?